It's that time of year when "pumpkin pie spiced" everything rolls around. Starts with Starbucks' Pumpkin Pie Spiced Latte and sort of carries on from there. Gotta say- it's totally ok by me! I love it! LOVE IT! 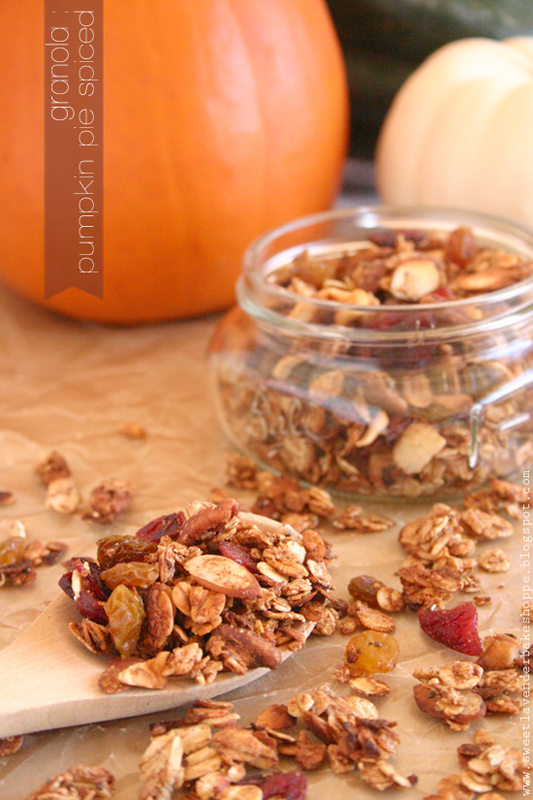 Here's an excellent way to incorporate that love of pumpkin pie spicy-ness into your morning! Unless you're Christina Applegate. Then you probably won't agree with my choice of morning spices (in her latest SNL monologue she explains her distaste for pumpkin spiced everything) HAHA. Funny, but couldn't disagree more. Bring on that spice! Anywho, it's crunchy, it's slightly sweet, it's completely unprocessed ;) and it's my new favorite breakfast alternative! 2. In a large bowl, mix thoroughly together your oats, almonds, pecan + walnut pieces, ground flax, chia seeds, ground cinnamon, pie spice, and ground dried ginger. Set aside. 9. Remove pans from oven and allow to cool completely. 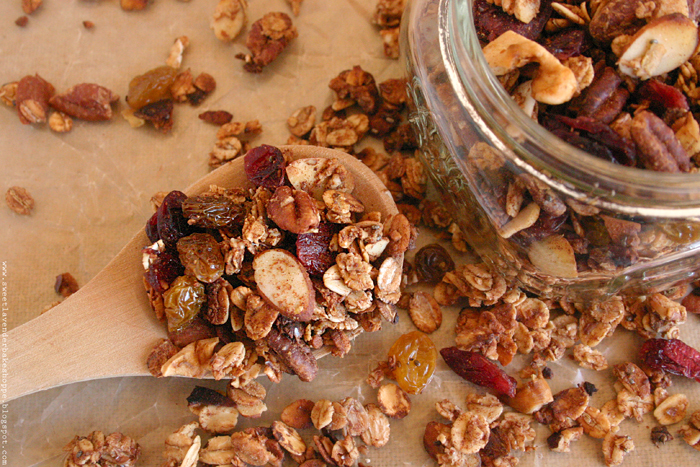 Once cooled, add granola to a large bowl and mix in your cranberries as well as your raisins. Then simply add to a large air tight container and munch away! You might want to make double. It's THAT good. Oh and PS- would be great gifted to loved ones! Just add to little glass mason jars and tie with ribbon or twine. Add a gift tag and viola! A "good for you" homemade gift! Um... absolutely stunning photo my dear!! I love love love it! Is it still warm in Cali?? 5 more months and I'll be out there celebrating my first anniversary! Oh and pumpkin spice anything and everything needs to be made at my house. So, I'm adding this one to the collection! IT IS!!! SO HOT! BUT actually it should cool down for the next 3 days! Then....HOT again :( Stupid weather. Haha. You'll be here?!!? HOW FUN!!!! Hmmm...might have to schedule a day to see ya!